Winds at crazy speeds and the swell of waves that can rise to towering heights! 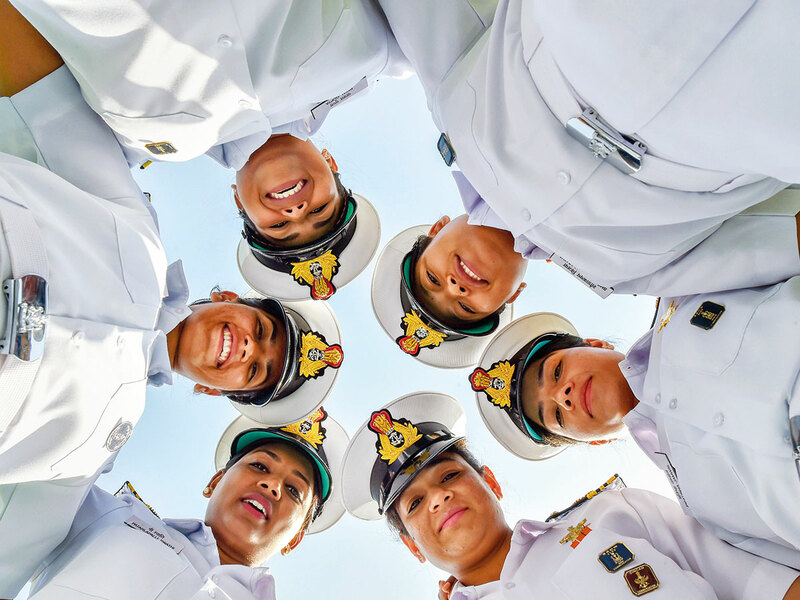 Senior officers had cautioned the six women of the Indian Navy — Skipper Lieutenant Commander Vartika Joshi, Lieutenant Commanders Pratibha Jamwal, P Swathi and B Aishwarya and Lieutenants S Vijaya Devi and Payal Gupta — on the hazards of a storm in the Pacific Ocean before they embarked on their circumnavigation voyage last September. Yet nothing prepared them for the stormy encounter on a January evening. The memory of that night is still clear. Caught in mid-sea between the wind and waves their sailboat, INSV Tarini, was tossed around from all sides. Under normal weather, one person could handle the steering comfortably but that evening three of them were finding it really hard to hold on to it. “With darkness looming high and visibility getting poor, we could not differentiate between the sky and sea. It was like getting into black holes,” says P Swathi. Not to forget the harness they wore to prevent themselves from going overboard. “One point of the harness was tied with the deck’s strong point,” said the Dehradun native Gupta. Despite everything, the naval officers had decided earlier that no one would discuss anything negative. Putting on a stoic front, they worked relentlessly for 20 hours through that night until the storm cleared. It’s the kind of stuff one watches awestruck on a movie screen. But this was not a scripted saga meticulously filmed but a tale of six brave-hearts who challenged themselves and wrote history. This expedition — the first Indian circumnavigation of the globe by women titled Navika Sagar Parikrama’ — was an exercise to promote women empowerment and ocean sailing by the Indian Navy. The expedition lasted for 254 days, which included 199 days at sea, covering a total of 21,600 nautical miles. Leaving the port of Goa on September 10, 2017, and meeting every criteria of circumnavigation – crossing the Equator twice, traversing all longitudes and the three great capes —Cape Leeuwin, Cape Horn and Cape of Good Hope — team INSV Tarini arrived in India on May 21. Tarini sailed 22,300 nautical miles, stopping at five ports namely Fremantle (Australia), Lyttleton (New Zealand), Port Stanley (Falklands), Cape Town (South Africa) and Port Louis (Mauritius). The last stop was unplanned and to meet an emergency. Besides encouraging the use of environment-friendly non-conventional renewable energy resources, the voyage was an endeavour to showcase the ‘Make in India’ initiative by sailing onboard the indigenously built INSV Tarini — a 55-foot sailing vessel built by M/s Aquarius Shipyard Pvt Ltd, Goa. Prior to the expedition, the women trained under Captain Dilip Donde — the first Indian to solo circumnavigate on an Indian built vessel, INSV Mhadei. Under his guidance the team did two expeditions — to Mauritius in 2016 / 2017 — and a voyage from Goa to Cape Town in 2016. For this adventure they followed the same route that Donde had earlier taken. If the Pacific storm defined the darkest hour of their odyssey, their surreal moment came with the sighting of the Southern Lights (the Aurora Australis). Spotting a sun halo while working on board was another fascinating wonder of nature. Nearing the coast of Lyttelton, whom did they have for company? Close encounters with huge pilot whales. Some came close to the boat while one dived under the boat to resurface on the other side leaving the crew in raptures. During their sojourn at Falkland Islands, they gaped at penguins and sea lions. However, life on board was not smooth with the swaying at all times. While navigating through the belt of the trade winds — 30 degrees south of the Equator — with winds blowing at 35 knots, Aishwarya mentions in her blog that they had to tether themselves to the galley handhold while cooking so that they did not fall — even the food containers rolled off from the shelves. Becoming philosophical, she also mentions about the tranquil moments they savoured. Gazing at the sea and reflecting on life; going to sleep under a star-lit sky, waiting for the clouds to burst for a fresh water shower, lighting up Tarini on Diwali night with diyas made of flour and ghee are fond memories. When a wave splashed onto the deck it brought home fresh squids to be turned into a hearty meal. An unusual visitor was a little bird who perched himself on Tarini for two days. Along the journey, the Tarini crew collected and updated meteorological, ocean and wave data on a regular basis for accurate weather forecast by India Meteorological Department (IMD) besides monitoring marine pollution on the high seas. At every port of call, the crew interacted with local government bodies and educational institutions. Reminding them of their home were dinners hosted by the Indian expatriate community. On their return journey — after crossing Cape-town — a large ship bound towards Uruguay stopped on its tracks when it spotted the Tarini on its radar. Wondering what this boat was doing in the middle of the sea, the ship stopped by. When the captain stepped on board he was surprised to be greeted by six women. “And, recognising us as fellow Indians, he was happy,” recollects Swathi. 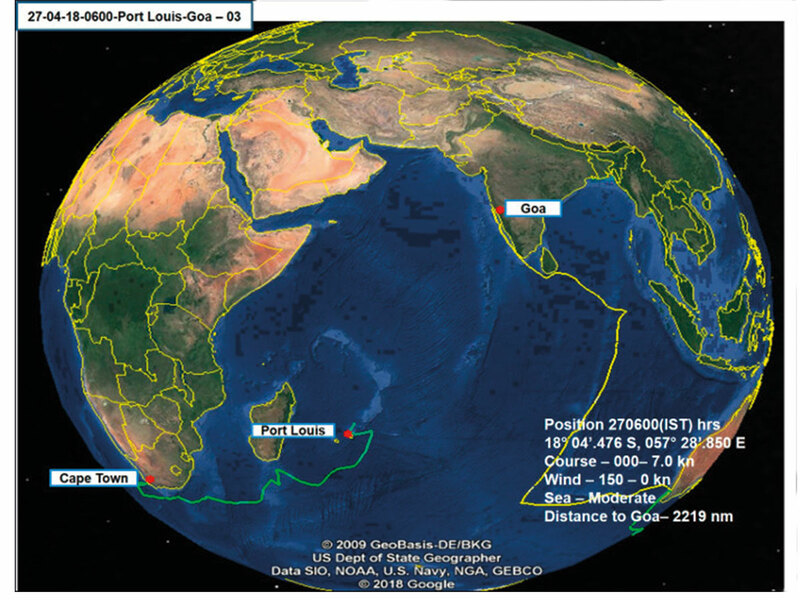 Another time, Tarini received a call from an international ship. The monsoons had begun and the sea was rough. The captain had spotted them on their screen and enquired if they needed help. Hearing a woman’s voice he paused before asking ‘Is it a woman? Their response — “Yes, we are six of us” — left him stunned. The last stumbling block was being stranded in the Indian Ocean for nearly four days in the scorching heat due to nil wind condition. Since their return, the six officers are visiting schools and colleges, sharing their experiences through motivational talks. They miss the sea and are itching to go back on another journey. Seeking another adventure, she and Gupta have signed up for a 15-day voyage from Kochi to Seychelles planned this month. “It is important to respect and value nature and be careful in using our resources. The sea taught us patience,” adds Gupta.